Each Thursday until the 2018 UCF Football season gets underway, Knight Sports Now will have a little fun with Throwback Thursdays. Every week, we’ll take a look at the Knights’ best game in each of their years competing at the FBS level. This week, we continue with 2006. UCF’s Conference USA debut in 2005 was promising, but the Knights fell flat in 2006. They endured losing streaks of three and four games on their way to a 4-8 record (with a 3-5 mark in conference play). However, one big highlight from the season came when UCF took down Marshall for the second straight year, this time by a score of 23-22. The Knights’ victory came with even more significance, as the Thundering Herd were celebrating the upcoming release of the film “We Are Marshall.” The movie’s star, Matthew McConaughey, led Marshall onto the field before the game and stuck around on the sidelines. A scene from the movie aired at halftime, adding to the atmosphere. To top it all off, the game was broadcast by ESPN2. Quarterback Steven Moffett struggled early and ended up on the bench for part of the game. UCF took a 13-9 lead into halftime before Moffett returned to connect with Mike Walker for a 28-yard touchdown. The Knights’ 20-9 lead didn’t last, with the Herd going on a run that included a touchdown and two field goals. Late in the fourth quarter, UCF trailed 22-20. With about two and a half minutes left, the Knights had one last shot. Starting at his own 19, Moffett helped the offense down the field quickly. He completed five passes before Jason Peters broke loose for a 14-yard run. That set up Michael Torres’ 22-yard game-winning field goal with seven seconds left. Moffett finished the game 13-of-19 for 165 yards and a touchdown, but the UCF backfield was a big help. Kevin Smith rushed for 166 yards on 26 carries before leaving with an injury, while Peters ended up with 108 yards on 13 carries. Torres’ late game-winner was his third field goal of the night. Oddly enough, all three kicks were from 22 yards out. 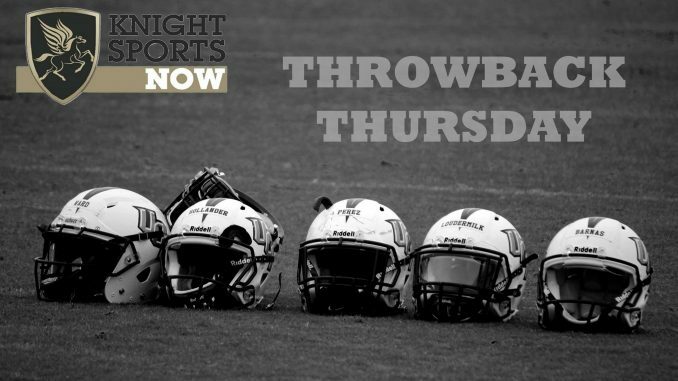 For previous Throwback Thursdays from Knight Sports Now, click here.